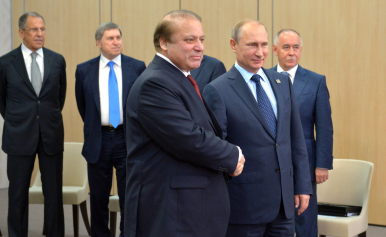 What's Driving Russia-Pakistan Cooperation on Afghanistan? A shared willingness to embrace the Taliban, plus suspicions about the U.S. role, bring Moscow and Islamabad together. On April 27, Pakistani Minister of Defense Khawaja Asif met with his Russian counterpart Sergei Shoigu in Moscow. During their meeting, Asif called on Russia to lead the process of stabilizing Afghanistan. Asif also reiterated Shoigu’s argument that an effective counterterrorism strategy in Afghanistan can only be devised by consulting all participants in the conflict. Even though the Moscow-Islamabad relationship has historically been plagued by distrust, Pakistan has emerged as a consistent advocate of an expanded Russian role in Afghanistan for two reasons. First, Pakistani policymakers have strongly supported Russia’s willingness to cooperate with the Taliban. Second, Russia has countered U.S. efforts to contain Pakistan’s influence in Afghanistan by diplomatically engaging Pakistan and accommodating Islamabad’s views on the stabilization of Afghanistan. The shift in Pakistan’s attitude toward Russia’s involvement in Afghanistan from indifference to vocal support has corresponded closely with Russia’s establishment of informal diplomatic ties with the Taliban. Since 2015, Russia has cooperated with the Taliban to weaken the Islamic State (ISIS) foothold in Afghanistan and deter the United States from maintaining a long-term military presence in the country. The Pakistani government has strongly supported Russia’s outreach to the Taliban. On April 9, the special assistant on foreign affairs to the Pakistani Prime Minister, Syed Tariq Fatemi, claimed that Moscow is “positively” using its influence over the Taliban to encourage the Taliban to participate in peace talks on Afghanistan’s future. Pakistan’s support for Russian engagement with the Taliban can be explained by two strategic imperatives. First, Pakistani and Russian policymakers have both concluded that their countries’ geopolitical influence over Afghanistan are maximized by a strengthened Taliban. Pakistan’s support for the Taliban is directly aimed at destabilizing Afghanistan, as Islamabad fears that a stable Afghanistan could forge a strategic partnership with India. Many Pakistani policymakers view India’s establishment of hegemony over Afghanistan as a potential security threat. This grim assessment is rooted in the popular assumption in Islamabad that Indian Prime Minister Narendra Modi is an opportunist who has implemented a virulently anti-Pakistani foreign policy agenda for political gain. Even though Russia maintains cordial relations with India, many regional analysts believe that Russia shares Pakistan’s desire for instability in Afghanistan. Indian academic Brahma Chellaney recently argued that Russia has collaborated with the Taliban to increase pressure on U.S. troops in Afghanistan, and to retaliate for U.S. support for Sunni rebels in Syria. Second, Russia and Pakistan both support the Taliban as a bulwark against the Islamic State’s encroachment into Afghanistan. The February 17 Sufi shrine attack in Sehwan caused Pakistan to escalate its internal repression of ISIS affiliates and heightened fears of a spillover of ISIS from Afghanistan to Pakistan. As the Taliban has deployed elite fighters since late 2015 to vanquish ISIS, Pakistan has facilitated the Taliban’s recapture of territory in Afghanistan through material support and the provision of diplomatic recognition to the Taliban. Even though Islamic State’s ability to threaten the security of the North Caucasus and Central Asia remains inconclusive, Russia has recently paid more attention to potential threat ISIS poses to these regions and its own security. Moscow’s December 2016 disclosure of communication with Taliban leaders on defeating ISIS revealed the synergy between Russian and Pakistani strategies toward Afghanistan. This synergy could have profound implications for Afghanistan’s long-term political trajectory, as the Taliban’s territorial sphere is larger than at any point since 2001. In addition to a shared desire to empower the Taliban, Pakistani officials have endorsed Russia’s preference for a multilateral solution to Afghanistan’s political crisis. In March 2017, Pakistan announced its decision to participate in a 12 party conference on Afghanistan hosted in Moscow, and praised Russia’s decision to support an Afghan-led peace process that engaged all warring factions at the bargaining table. Even though Pakistan continues to be a major recipient of U.S. military aid, many members of the Pakistani military establishment supported Russia’s decision to exclude the United States from its Afghanistan peace talks. This support can be explained by the Pakistani military’s frustration with Washington’s unwillingness to consult Pakistan and its principal ally, China, on the stabilization of Afghanistan. On March 5, a senior Pakistani military official told the U.K. Telegraph that Islamabad would support a Syria-style Russian counterterrorism operation in Afghanistan if U.S. efforts failed to ameliorate the country’s ongoing political turmoil. With Donald Trump having publicly criticized Pakistan’s role in destabilizing Afghanistan, many Pakistani policymakers believe that a Russian military intervention in Afghanistan will increase Islamabad’s influence over Afghanistan’s political trajectory. The Kremlin has given credibility to these assumptions by describing Pakistan as a constructive counterterrorism partner in public statements and expanding bilateral military cooperation with Pakistan. On March 30, a Russian military delegation, accompanied by senior Pakistani army officers, made a historic visit to the conflict-ridden Pakistan-Afghanistan border areas of North and South Waziristan. After this visit, the Pakistani military’s official media wing announced that Russia’s delegation had praised Pakistan’s efforts to reduce violence on Afghanistan’s borders. Russia’s September 2016 joint counterterrorism drill with Pakistan also demonstrated to the international community that Moscow is willing to consider Islamabad as a viable military partner, and suggests that Moscow would request Pakistani support if it intervened militarily in Afghanistan. In addition to expressing solidarity with Pakistan, Russia has won Islamabad’s favor by actively engaging China in its efforts to resolve the Afghanistan crisis. The importance of Russia’s alignment with China in Afghanistan to Pakistani policymakers was recently confirmed by Pakistan’s former envoy to Russia Khalid Khattak, who argued that improved Pakistan-Russia relations were a direct consequence of Sino-Russian engagement on Afghanistan’s future. Even though the motivations for Russia-Pakistan cooperation in Afghanistan occasionally differ, Islamabad’s increasingly vocal support for expanded Russian involvement in Afghanistan could profoundly impact Afghanistan’s long-term political trajectory. While Russia has yet to demonstrate a proclivity to intervene militarily in Afghanistan, the consolidation of the Islamabad-Moscow partnership poses a major challenge to U.S. policymakers seeking to unilaterally shape Afghanistan’s future political direction. Samuel Ramani is a DPhil candidate in International Relations at St. Antony’s College, University of Oxford. He is also a journalist who contributes regularly to the Washington Post and Huffington Post. He can be followed on Twitter at samramani2 and on Facebook at Samuel Ramani.